I can’t believe it’s that time again, time flies by so quickly! I’ve just looked up when, officially, Spring starts in the UK. Not that I’ve found the definitive answer, the Met Office say it’s the 1st of March but historically it’s the time of the vernal equinox, 20/21st March. I think it’s best to let nature decide, and we’ll just watch! But it’s not far away, and so I’ve decided that next week will be the last Reasons to be Cheerful Linky for a while, as I started it to get us through the winter gloom. Not that I shall stop looking on the bright side wherever possible, Planet Penny is supposed to be jolly place to visit! So I’m going to share my own Reasons to be Cheerful this week, and hope that as many of you as possible will join in for this week and the next and we can finish on a high. Despite the cold the seeds I’ve sown in their mini propagators are beginning to germinate, always a moment of magic. If you are interested in my garden project for this year I’m keeping a note in The Garden Dairies, with weekly updates on the drop down menu at the top of the blog. Nothing much is happening just yet, mind you, but it won’t be long! Sometimes you see things you just can’t resist, and this was one of them. Over on Fan my Flame, Gina is on a mission to raise funds for an exhibition and has started a project, putting little books in altered match boxes. You can read all about it here. She is just exquisite, so tiny… Don’t forget, a matchbox is only 2″x1.5″ or 5cm x3.5cm, and even enlarged here, the details are perfect. Gina is making 50 little books in altered matchboxes, for the incredible price of £10 each, no matter how intricate they are. If you visit Gina’s blog you can follow the project, and see whether you fall in love with a matchbox book like me! This entry was posted in Craft, Nature, Reasons to be Cheerful, Veg Patch and tagged Alice in Wonderland, Gina Ferrari, matchbox books, Reasons to be Cheerful on February 15, 2012 by penny. I live in Norfolk, England in a cottage on the edge of the Norfolk Broads where it can be peaceful and beautiful, or wet and muddy, or occasionally wild and windswept. With me is husband Tim, Henry the elderly and opinionated tabby cat, and Higgins, the miniature dachshund with a massive personality. You’ll find me chattering on about wool and textiles, knitting and crochet, recipes, books and patterns, exhibitions and shopping and of course, the adventures of a small dog! Planet Penny has a Facebook Page, you can find me on UK Handmade and I am featured on Channel4/4Homes Favourite Craft Blog List. 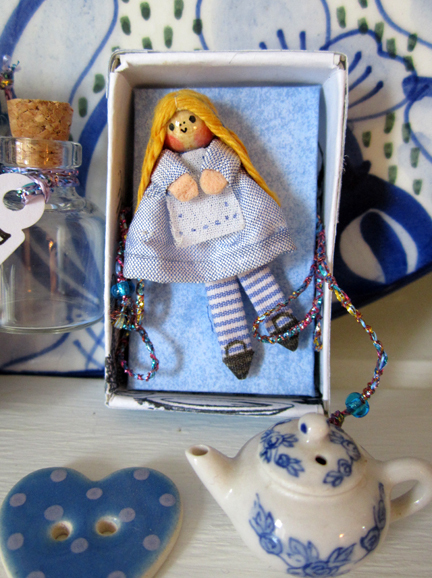 As for the teeny tiny Alice she most surely is from Wonderland. How incredibly precious! I will go straight to Gina’s blog and see more of her makes for sure. I love the idea of miniature and Alice and I went through a phase of making nature match boxes for each other, I think we may need to start something like this again! The roses are stunningly beautiful! 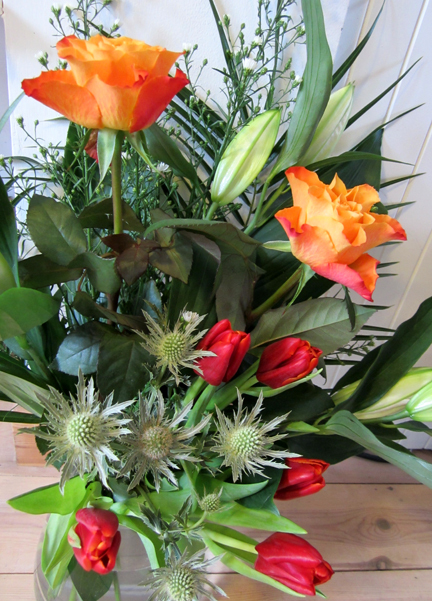 Mind you, the Lily, the Tulips, Daisies and Eryngiums are pretty stunning too. I recognised Gina’s red fan immediately. She makes some wonderful things and I must make a point of going back to chose something in a box. Thank you for the cheeriness! Wow, what gorgeous roses! Very unusal. And I adore Alice! I must have a look at Gina’s blog. 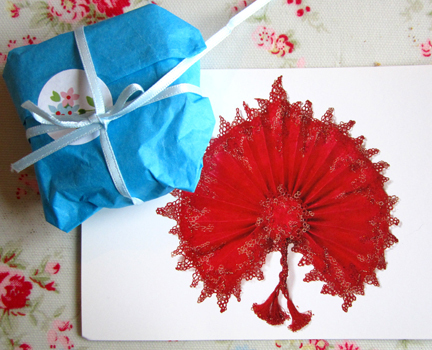 Thank you for such a lovely testimonial Penny and I’m delighted that you like Alice. Today I’ve been doing graffiti but I’ll have to wait for the light to take photos. Wonderful vibrant flowers, and Alice is a marvel in miniature. Back in my arty days I used to make mini books out of old falling apart books … such fun! I’ve come back to finally comment on your lovely heary garland and find you’ve busily written so much more. Thanks for the inspiration Penny. My mum seeing mine yesterday morning has already asked me to make her one too. What a fabulous Idea of Gina’s. Like the Alice idea of tiny treasures in a matchbox for Little Bun’s vintage Alice tea party we’re having for her March birthday. On your other post – Higgins and Henry made me laugh over their naughty rug antics. The cats win here over Alfie every time. 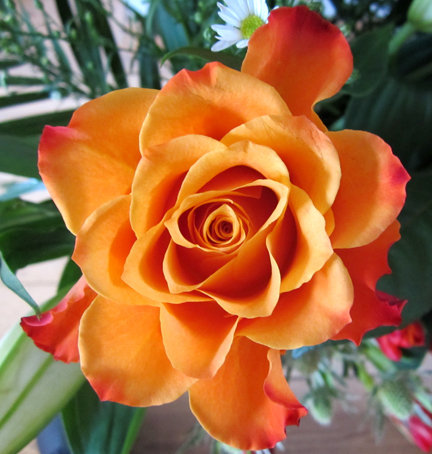 Those orange roses are amazingly beautiful. And I love those spiky things (no idea what they’re called). 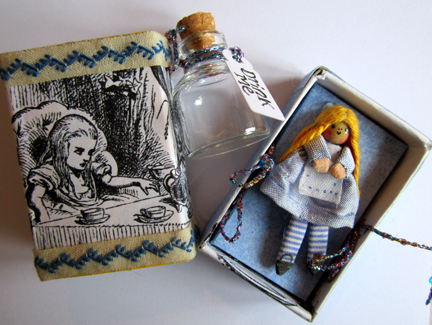 The Alice is so perfect – I really like tiny little projects like that. The teapot and “Drink Me” bottle are wonderful touches. Thanks so much for hosting this all winter, Penny – it’s been great fun. Wow that Rose is stunning, looks just like fire, I’ve never seen one like that. 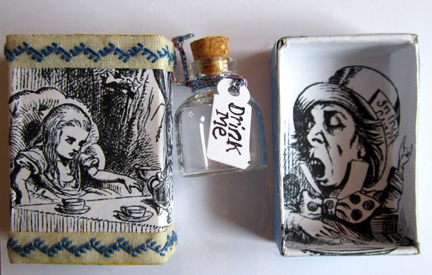 Love the little Alice matchbox, what a lovely idea. 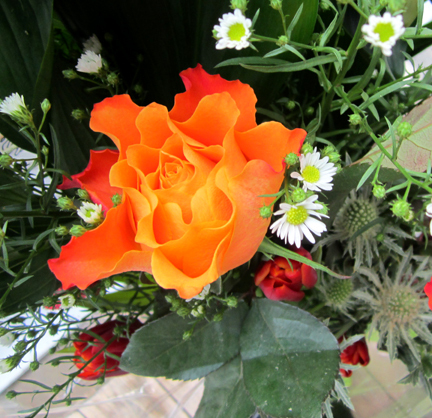 Gorgeous, gorgeous flowers! 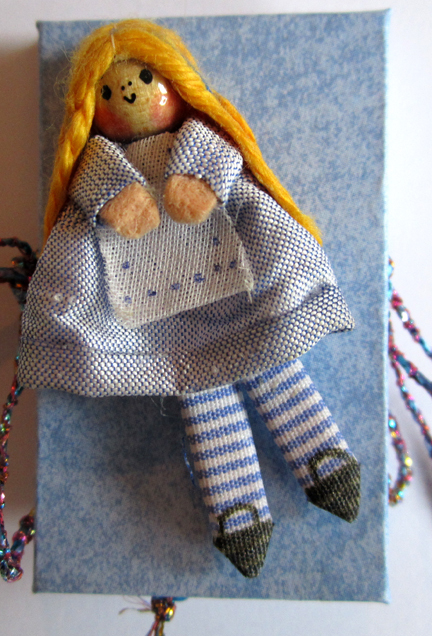 And love that tiny Alice.